Today I’m bringing you another super simple weeknight meal. 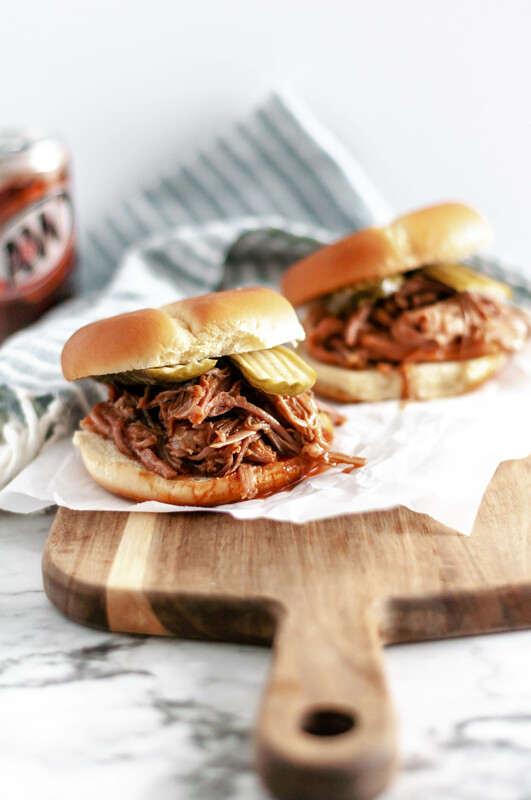 Rootbeer BBQ Pulled Pork Sandwiches only need four ingredients and all day in the slow cooker to sweet and saucy perfection. Sandwiches are my JAM. I could eat one every day of my life and not get bored. There’s just so much variety. And bread. But I never used to think of sandwiches when it came to dinnertime. I just always seemed to consider them lunch food. With kids in school and busy after school activities though they started to become a more popular option around here. Usually sandwiches require a small amount of ingredients and are easy to throw together. And nothing could be more true for these Rootbeer BBQ Pulled Pork Sandwiches. First of all, the pork is simply seasoned with salt and pepper and cooks away in the slow cooker all day. Couldn’t get easier. Because we’re keeping the preparation and cooking method of this pork super simple, it’s important to use the right cut. I went with a bone-in pork shoulder roast for this and it makes all the difference. Because the bone is still in the meat, you get a much richer pork flavor. It will also have some fat on it still which adds even more flavor and juiciness. It’s also less likely to dry out in the slow cooker. Please, whatever you do, don’t use a pork tenderloin in this recipe. It will be dry and sad and lacking in that rich, delicious pork flavor. The other huge selling point for these sandwiches is that the only other ingredients you need is rootbeer, bottle of your favorite barbecue sauce and hamburger buns. I normally prefer a sweeter barbecue sauce (hello KC BBQ) but with this pulled pork I usually go with a smokier or slightly spicy sauce since the rootbeer will add a good amount of sweetness. Use what you and your family love and I promise it’ll be delicious. There is a sweet, rootbeer flavor in the sauce but nothing overpowering. Just that little “hmm” in the background when you taste it. And if you aren’t a big fan of rootbeer (hello, it’s me) you’ll still enjoy these sandwiches. You could also try it with Dr. Pepper or cherry coke to mix things up. If you’re a pulled pork purist, pile that delicious rootbeer barbecue drenched pork on some hamburger buns and get at ’em. Buuut, if you like a little variety in your life you should definitely top them with some pickles slices and a hearty serving of creamy coleslaw. That’s my personal favorite when it comes to a BBQ pulled pork sandwich. Rootbeer BBQ Pulled Pork Sandwiches are super simple to make in the slow cooker. Four ingredients & hours in the slow cooker to tender, saucy perfection. Season pork roast generously with salt and pepper. Pour water in bottom of slow cooker. Add roast to slow cooker. Cook on high for 5 to 6 hours or low for 8 to 10 hours. Remove the bones and excess fat from the roast and discard. Remove 3/4 cup of the liquid. Shred pork with two forks. Stir in rootbeer and bbq sauce. Cook 15 to 30 minutes on low to heat through. Serve on hamburger buns.